My sailboat to-do list has been growing all year, and there was no way around it, this weekend I had to do some maintenance and work off some of my lingering projects. Auxiliary power on Gimme Shelter is supplied by the original 1982 Universal 5424, a marinized Kubota diesel. This weekend I decided to work through the raw water system. The strainer is basically a jar with a metal basket inside. Water is pushed through the top of the basket, and then shoots out all of the tiny holes of the metal strainer while leaving debris inside the metal strainer basket. If you look at the photo above, mine is very easy to access on the port side of the engine. I pulled out the strainer basket and found just a little mud, sprayed it with the hose and put it back together. No problems. It’s recommended that you change the raw water impeller annually. I hadn’t had any water flow issues, and we hadn’t put many on hours on the engine, so I had let Gimme Shelter go two full years without replacing it. 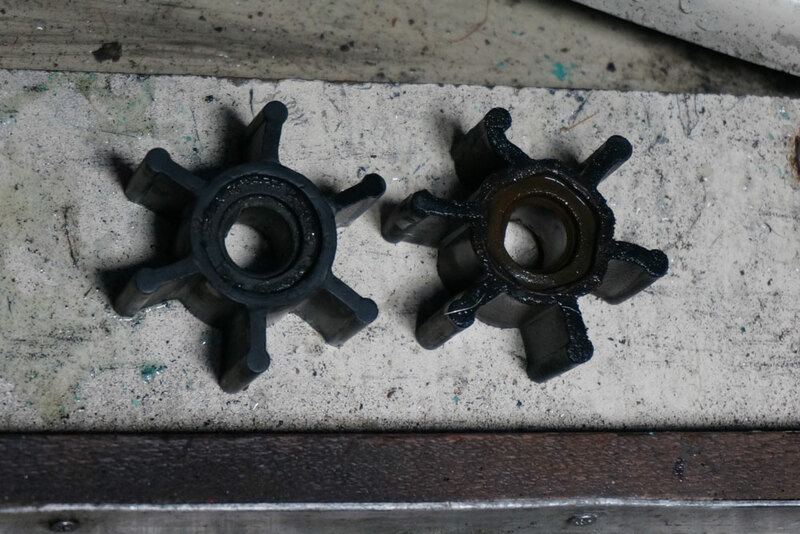 It was still working, but when I pulled it out, I could see the difference between the old and new impellers. I really like the Oberdorfer pump because it’s easy to access on the front of the engine, and it only takes four screws to open it up. The impellers just push onto the keyed center shaft, and you’re ready to go. 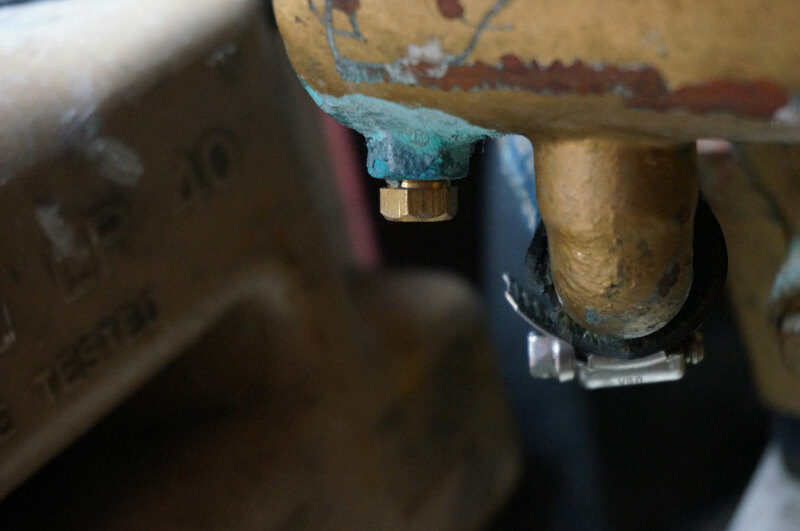 The only catch is that you have to replace the paper gasket every time you open the pump. You also have to make sure you remove all of the old paper gasket before you install the new one or you won’t get a good seal. In the past I have resorted to cutting a new gasket out of construction paper with a pocket knife, but it’s definitely easier just to order a new gasket when you order the new impeller. 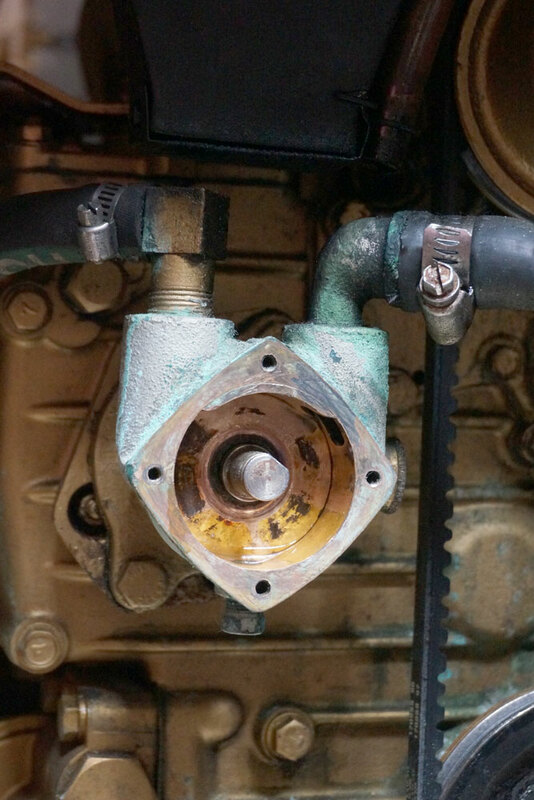 From the pump, the raw water moves to the heat exchanger where the antifreeze moves through tubes and transfers the heat of the engine into the seawater before it’s sent overboard in the exhaust. 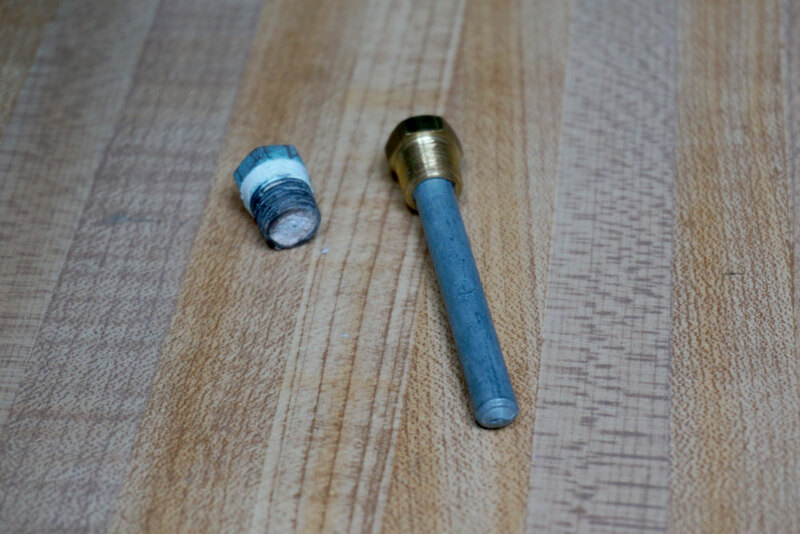 A sacrificial zinc anode is screwed into the heat exchanger to protect it from corrosion. If the heat exchanger tubes corrode out, you’ll end up with seawater in your antifreeze and vice versa, so this zinc is very important. I’ll admit it. I’d been as lazy about the zinc as I had been about the impeller, and it hadn’t been changed in two years. When I unscrewed it, this is what came out. On the left is the two-year-old zinc. On the right is a new pencil zinc. This was bad. 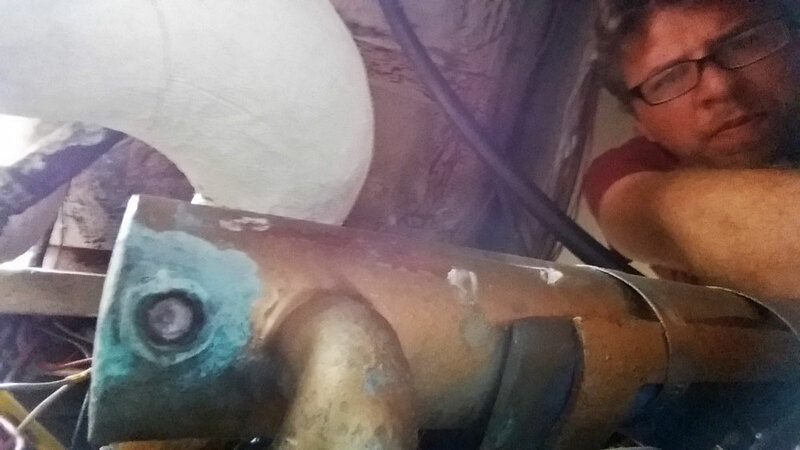 However, I didn’t have any seawater coming out of the hole, so I resorted to taking a selfie with the heat exchanger to see what was going on down there. There was still zinc left in the hole. However, two or three pokes with a screwdriver, and that little bit of zinc left crumbled to pieces and fell right out. I then installed the new zinc and promised myself I’d start checking it every six months. Once the new zinc was installed I opened the seacock and watched for leaks from the strainer lid as it filled. With no leaks from the strainer, I cranked up the engine and looked for waterflow from the exhaust. 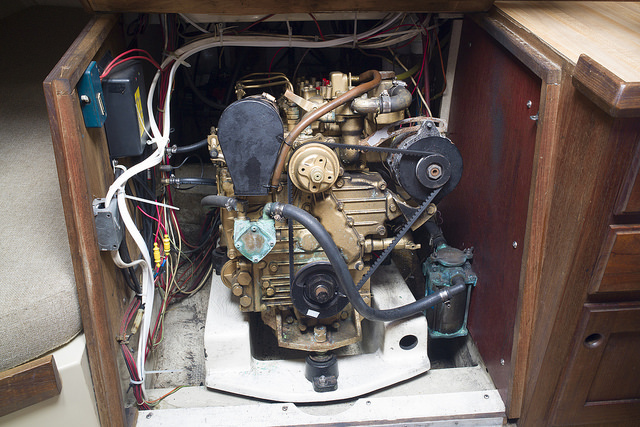 Water was flowing, so I popped back into the cabin to check for leaks from both the raw water pump and then zinc. Once I’d verified that my maintenance hadn’t caused any new problems, I moved on to my next project, which I’ll blog about tomorrow — installing a NMEA 2000 backbone. Yes, it’s based on a 3 – cylinder Kubota diesel. The 5424 is almost identical to the M25. Thanks for the post. I’m looking to change my impeller as well but can’t seem to find a suppler on line, have you got a source for parts. I have some heavy corrosion/oxidation/idkwhat you call it but that green growth on my raw water pump. I plan to take it off/apart and wonder if you have any recommendations for what to clean it up with? I was thinking a brass brush but maybe there is a good chemical to use? …but not sure whether I just need a new impeller or should replace bearings and the lot? I just purchased the vessel (1994 Catalina 270LE) and I’m 95% sure nothing has been replaced in the last 2 years or more. Just some steel wool will clean it up. You should replace the impeller annually. I doubt you need the bushings unless they’re squealing.